Tennuvian horses are a cross between Tennessee Walking Horses and Peruvian Pasos. Although there is a strong chance these two breeds have been crossed before, the Tennuvian name was officially coined by Paula Bosner of Colorado. Paule purchased one of these crosses and immediately fell in love with the animal, so much so that she sold off her quarter horses and bought a Peruvian stallion for breeding. 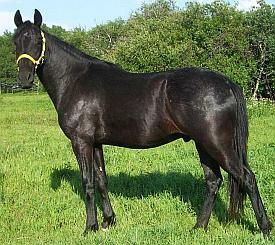 Tennuvian horses have smooth gaits much like Tennessee Walking Horses; however they are smaller. They have a head much like a Peruvian Paso Fin small and refined. They are able to gait for long distances, have good endurance, good hoof, comes in all colors and is comfortable for the rider. The temperament is gentle, intelligent, easy to train, willing, and wants to please. Its genesis was a cross between the Tennessee Walking Horse and the Peruvian Paso Fino. The Tennuvian Horse Registry was created in 1991. Tennessee Walking Horse-Peruvian Horse crosses are accepted for registration, as are Tennuvian to Tennuvian, and Tennuvian to either Tennessee Walker or to Peruvian. Their gaits are 4-beat, generally smoother than a Tennessee Walker but with a large reach or stride like the Peruvian Paso. It has been described as a "soft prance."